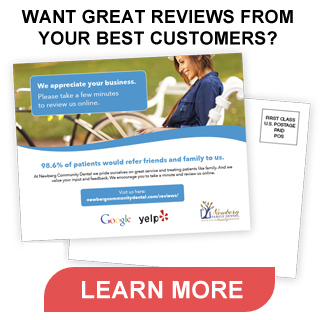 Word of mouth ranks as the best and most inexpensive way for a dental practice to attract new patients. While newspaper ads and Yellow Page listings were once a reliable source for attracting new patients, marketing mediums have changed over the last decade, making these forms of advertising less effective at reaching a practice’s target audience. The Internet has all but shuttered Yellow Page indexes, and many newspapers have started making the switch to online content, while slowly abandoning print. Billboard, magazine, radio, and television ads still offer advertisers the opportunity to reach a larger audience, but they often carry a high price tag that can quickly drain a practice’s marketing budget. Investing in the wrong form of advertising could lead to few new patients and a poor return on investment. The primary purpose of any marketing campaign is to effectively reach a practice’s target audience within the local community. While many ways exist that allow a practice to accomplish this goal, word of mouth still ranks the most effective. To achieve a solid word of mouth advertising campaign for your dental practice, you need to embrace the impact social media offers on new patient referrals. It’s impossible to measure the impact placing a phone call has to a patient following a particularly tough procedure. However, you do know that such an action helps to build respect, loyalty, and trust among patients. Consider the use of social media in much the same manner. Just as with a follow up phone call, the impact social media sites like Google+, Twitter, and Facebook can have on a practice cannot be underestimated. To understand why social media really matters, you need to look at why your friends, relatives, neighbors, and coworkers use the wide variety of social platforms that are available – to maintain and rekindle personal connections. As a health care provider, social media allows dentists to connect to patients in ways that are not always possible during the short periods of time they spend interacting with them during appointments and consultations. Social media allows you establish a brand identity for your practice that current and potential future patients can grow to recognize and trust. This offers long-term benefits when trying to attract new patients by building through word of mouth. Lets take a look at a few of the different social media platforms, and what they can offer your practice. Facebook – With over 1 billion users, Facebook has become not only an integral way for people to connect, but also an effective platform for businesses to reach current and new customers. Sharing videos, events, photos, and information through specially created Facebook Business Pages is straightforward and incredibly productive. The biggest benefits a business page offers is that it introduces your practice to potential new patients through information delivered to them from a trust member of their own network. Twitter – Twitter has quickly garnered the reputation as an effective marketing tool, perfect for sharing quick and focused updates, connecting with patients and peers, and for learning from past customer experiences. It’s fairly easy to maintain a presence on Twitter, and the platform provides your practice with the potential to reach millions of future patients at near instantaneous speeds. Post frequently with information that’s relevant to patients. Monitor newsfeeds for stories of interest that relate to the dental field. Even when not directly related to your practice, if something has the potential to be of interest to patients, tweet it. Always link back to your Facebook page or website whenever possible. The keys to a great tweet are intriguing content, site links, and keywords. Follow as many accounts related to dentistry as possible. This includes dental product manufacturers, dental specialty fields, dental bloggers, dental associations, and any other type of dental related account that helps increase your audience. Google+ – Google’s version of Facebook, Google+ offers just as powerful a social media tool as its better-known competitor. Unlike Facebook, however, Google+ offers the potential of influencing Google search results. Google+’s social sharing features have been proven to drive web traffic, while also improving your practice’s website ranking in organic search results. “Circles” are one of Google+’s key features, allowing your practice to branch out among a variety of followers. At Local Fresh, we can help your dental practice handle the demands of social media content. Contact us today by clicking here, and see the difference that social media marketing makes when it comes to achieving new patient referrals.